Objectives: Several studies have shown comparable results in long-term graft and patient survival, comparing a tacrolimus-based therapy to cyclosporine, while other studies have shown that a tacrolimus-based regimen had a better renal function with fewer episodes of acute rejection. Most of these studies were in a white population. We describe our experiences comparing tacrolimus versus cyclosporine maintenance therapy in a Saudi population. Materials and Methods: All patients from 2003 until 2008 in our transplant clinic were evaluated. A retrospective analysis was done comparing patient and graft survival, kidney function, and metabolic profile. Results: There was no statistical difference in acute rejection rate between the cyclosporine group and the tacrolimus group (18.7% vs 20.9%; P = .756). Mean serum creatinine was not statistically different between the 2 groups. Patient and graft survival at 1 and 2 years also were similar. Although patient and graft survival were similar, the cyclosporine group had a higher level of cholesterol compared with the tacrolimus group (4.6 ± 1.03 mmol/L vs 4.1 ± 0.80 mmol/L; P = .010). Conclusions: There is no difference in 1- or 2-year patient and graft survival between patients maintained on cyclosporine compared with tacrolimus. However, patients on cyclosporine had a higher blood pressure and serum cholesterol level. All these studies were done mainly in white populations, and it is well-established that racial and ethnic differences may very well play an important role in graft survival, patient survival, and acute rejection rates.8 Here, we describe our experiences comparing tacrolimus- versus cyclosporine-maintenance therapy in a nonwhite population looking at graft and patient outcomes, as well as complications of renal transplant between the 2 groups. All transplant patients who were followed up at the Nephrology Clinic in our institution from 1998 until 2008 were identified using our database system. This clinic is managed by 4 nephrologists. We selected patients transplanted from 2003 forward, because that is when the computerized system for laboratory and electronic records began. Allograft survival was determined from the date of transplant until death or return to dialysis. All locally transplanted patients received induction therapy with thymoglobulin as per our protocol: thymoglobulin 1.5 mg/kg/d IV infusion. Patients receive 3 to 6 dosages (total maximum dose: 9 mg/kg). The dosage was adjusted for adverse effects as per thymoglobulin guidelines. All acute rejection episodes were biopsy-proven acute rejections. All patients who were living-unrelated were transplanted abroad (commercial transplant), data regarding their induction therapy, HLA typing, and cytomegalovirus donor status were not available. Demographics of recipient and donor data (when available); transplant data (when available); and clinical events and outcomes (including graft loss, patient death, acute rejection, serum creatinine measurements, cyclosporine and tacrolimus levels after transplant, and infectious events) were obtained using chart review. Patients were not directly questioned with regard to their transplants. We first compared recipient and known transplant characteristics between the cyclosporine and tacrolimus groups. All patients were managed by the same physicians in the nephrology clinic. Overall graft survival, patient survival, incidence of acute rejection, and serum creatinine at 1 and 2 years after transplant were compared. Statistical analyses of the data were done using SAS (Statistical Analysis System, version 9.2, SAS Institute Inc., Cary, NC, USA). The t test was used to test the difference between local and tourism groups for continuous variables; the chi-square was used for categoric variables. A total of 158 patients were included in this analysis (48 in the cyclosporine-treated group and 110 in the tacrolimus group). All patients were Saudis. Demographic data for the patients are shown in Table 1. 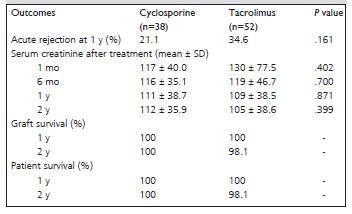 Patients in the cyclosporine group were older than they were in the tacrolimus group (45.3 ± 15.3 y vs 38.5 ± 14.8 y; P = .01). There were more males in the cyclosporine group compared to the tacrolimus group (79.1% vs 60%; P = .019). There was no significance in body mass index, diabetes, or coronary artery disease between the 2 groups. 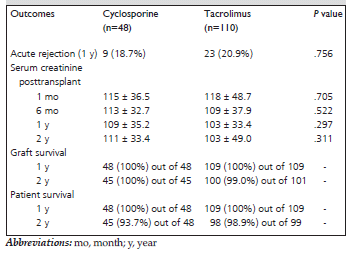 There was a higher percentage of patients in the tacrolimus group than in the cyclosporine group who were on dialysis before transplant (40% vs 22.9%; P = .03). In terms of donor source, all kidneys in the cyclosporine group came from living donors (100%) as opposed to only 77.3% in the tacrolimus group (P = .001). 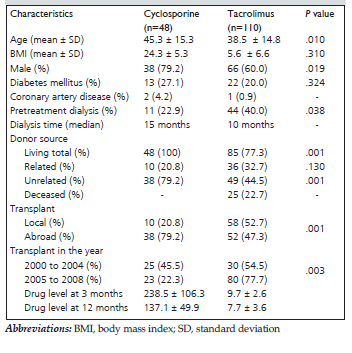 Of the living donors, the majority in the cyclosporine group were living-unrelated that were done abroad (79.2%) as opposed to 44.5% in the tacrolimus group (P = .001). Drug levels in the first 3 months and the first year are also shown in Table 1. There has been a steady increase in tacrolimus use over time (Table 1). From 2000 until 2004, 45.5% of the patients were on cyclosporine, and the remaining 54.5% were on tacrolimus. From 2005 until 2008, the use of cyclosporine dropped to 22.3%, while 77.7% were on tacrolimus. This is likely because of the adaptation of a tacrolimus-based regimen in our local transplant immunosuppression protocol since 2005. 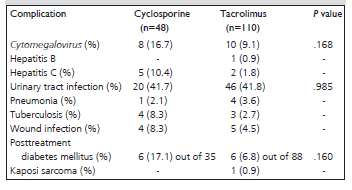 Comparing the cyclosporine to the tacrolimus group, there was no difference in acute rejection rate between the 2 groups (18.7% vs 20.9%; P = .756). Mean serum creatinine was not statistically different between the 2 groups in the first month, 6 months, 1 year, and 2 years after surgery (Table 2). Patient and graft survival in 1 and 2 years were also similar in both groups (Table 2). 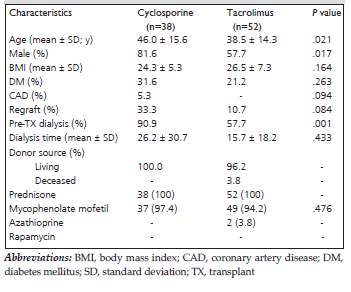 Given that commercial transplant is associated with an increased risk of acute rejection,9 we also compared cyclosporine to tacrolimus maintenance therapy in commercial transplant recipients. Ninety patients were included in the analysis (38 in the cyclosporine-treated group and 52 in the tacrolimus group). All patients were Saudis. Demographic data for the patients are shown in Table 5. Similar to the above findings, patients in the cyclosporine group were older than they were in the tacrolimus group (46.0 ± 15.6 y vs 38.5 ± 14.3 y; P = .02). There were more males in the cyclosporine-treated patients compared to the tacrolimus group (81.6% vs 57.7%; P = .017). There was no significant difference in body mass index, diabetes, or coronary artery disease between the 2 groups. As expected, in commercial transplants, the majority of kidney transplants in both groups came from living donors except for a few patients in the tacrolimus group (Table 5). In terms of transplant outcome in commercial transplant recipients, there was no statistical difference in acute rejection rate between patients on cyclosporine versus tacrolimus therapy (18.7% vs 20.9%; P = .756). Mean serum creatinine was not statistically different between the 2 groups in the first month, 6 months, 1 year, and 2 years after surgery (Table 6). Patient and graft survival in 1 and 2 years were also similar in both groups (Table 6). Posttransplant complications in this analysis also showed no significant difference (detailed complications comparing the 2 groups are outlined in Table 7). Numerous immunologic and nonimmunologic factors play a role in graft and long-term survival.14, 15 Racial and ethnic differences are 1 example, and unfortunately, the majority of the studies mentioned were done in white populations. None of which had a nonwhite, non-African American population. Whether the same outcome can apply to our study population, remains to be answered. To our knowledge, this is the first report comparing both regimens in our population. We have shown that there is no difference in graft survival, patient survival, serum creatinine level, and acute rejection rate between the 2 groups. However, the cyclosporine group had a higher blood pressure and higher serum cholesterol. That being said, there were significant differences between the 2 groups at baseline. All patients in the cyclosporine group were living transplants; this might overestimate the effect of cyclosporine favoring the outcome of that group. Human leukocyte antigen status and immunologic risks were not fully available in both groups. Much of the information regarding induction therapy in the cyclosporine group was missing. In general, patients transplanted abroad tend to be heavily immunosuppressed to avoid immediate rejection and that might have translated into lesser episodes of acute rejections and a trend to higher infection in the cyclosporine group. Our results are consistent with many other studies; however, we have to take these outcomes with caution. Our study was retrospective and there might be a selection bias because we may have missed patients who were transplanted abroad and died of complications before returning home. We also may have missed patients who elected to be followed up elsewhere. Although the outcome is similar in terms of patient and graft survival, the follow-up in our study is short and might overestimate the favorable outcome. The number of patients is still small compared with the number of living-related and deceased-donor transplants performed annually, especially in the cyclosporine group. Although, there might be enough evidence to start patients on ELITE-symphonylike regimen from the start, as long as the patient’s profile is similar to the one studied in the trial, one cannot justify converting all patients from cyclosporine-based to tacrolimus-based therapy at this time. In third-world countries, tacrolimus and measurement of its level might not be readily available compared to cyclosporine. Considering the current difference in cost, and with the current evidence, at least in our population, one cannot justify switching therapy at this time without good indications, such as rejection episodes or intolerable adverse effects (eg, hirsutism and gingival hyperplasia). Kiuchi T. CNIs: immediate benefits but storing problems for the future? Transplantation. 2008;86(8):1026-1027. Goldfarb-Rumyantzev AS, Smith L, Shihab FS, et al. Role of maintenance immunosuppressive regimen in kidney transplant outcome. Clin J Am Soc Nephrol. 2006;1(3):563-574. Suthanthiran M, Strom TB. Renal transplantation. N Engl J Med. 1994;331(6):365-376. Gonwa T, Johnson C, Ahsan N, et al. Randomized trial of tacrolimus + mycophenolate mofetil or azathioprine versus cyclosporine + mycophenolate mofetil after cadaveric kidney transplantation: results at three years. Transplantation. 2003;75(12):2048-2053. Woodward RS, Kutinova A, Schnitzler MA, Brennan DC. Renal graft survival and calcineurin inhibitor. Transplantation. 2005;80(5):629-633. Jurewicz WA. Tacrolimus versus cyclosporin immunosuppression: long-term outcome in renal transplantation. Nephrol Dial Transplant. 2003;(18 suppl 1):i7-i11. Ekberg H, Tedesco-Silva H, Demirbas A, et al. Reduced exposure to calcineurin inhibitors in renal transplantation. N Engl J Med. 2007;357(25):2562-2575. Eckhoff DE, Young CJ, Gaston RS, et al. Racial disparities in renal allograft survival: a public health issue? J Am Coll Surg. 2007;204(5):894-902; discussion 902-903. Alghamdi SA, Nabi ZG, Alkhafaji DM, et al. Transplant tourism outcome: a single center experience. Transplantation. 2010;90(2):184-188. Marcard T, Ivens K, Grabensee B, et al. Early conversion from cyclosporine to tacrolimus increases renal graft function in chronic allograft nephropathy at BANFF stages I and II. Transpl Int. 2008;21(12):1153-1162. Erratum in: Transpl Int. 2008;21(12):1196. Shihab FS, Waid TH, Conti DJ, et al. Conversion from cyclosporine to tacrolimus in patients at risk for chronic renal allograft failure: 60-month results of the CRAF Study. Transplantation. 2008;85(9):1261-1269. Krämer BK, Del Castillo D, Margreiter R, et al. Efficacy and safety of tacrolimus compared with ciclosporin A in renal transplantation: three-year observational results. Nephrol Dial Transplant. 2008;23(7):2386-2392. Gonzalez Molina M, Morales JM, Marcen R, et al. Renal function in patients with cadaveric kidney transplants treated with tacrolimus or cyclosporine. Transplant Proc. 2007;39(7):2167-2169. Bai JP, Lesko LJ, Burckart GJ. Understanding the genetic basis for adverse drug effects: the calcineurin inhibitors. Pharmacotherapy. 2010;30(2):195-209. Martins L, Fonseca I, Sousa S, et al. The influence of HLA mismatches and immunosuppression on kidney graft survival: an analysis of more than 1300 patients. Transplant Proc. 2007;39(8):2489-2493. Table 1. Characteristics of patients on cyclosporine versus tacrolimus. Table 2. Serum creatinine, graft, and patient outcomes of cyclosporine versus the tacrolimus group. Table 3. 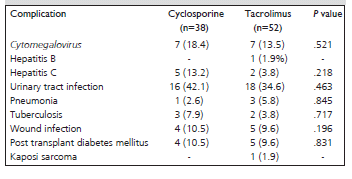 Posttransplant complications of cyclosporine versus the tacrolimus group. Table 4. 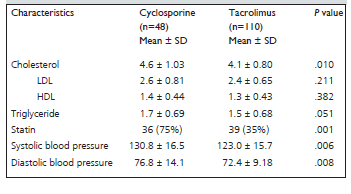 Posttransplant metabolic profile and blood pressure in the cyclosporine versus the tacrolimus group. Table 5. Characteristics and immunosuppression comparing cyclosporine versus tacrolimus in commercial transplant recipients. Table 6. Graft and patient outcomes of cyclosporine versus the tacrolimus group in commercial transplant recipients. Table 7. Posttransplant complications of cyclosporine versus the tacrolimus group in commercial transplant recipients.